TP-Link (simplified Chinese: 普联技术; traditional Chinese: 普聯技術; pinyin: pǔ lián jì shù, stylized as tp-link), is a Chinese manufacturer of computer networking products based in Shenzhen, Guangdong, China. TP-Link was founded in 1996 by two brothers, Zhào Jiànjūn (赵建军) and Zhào Jiāxīng (赵佳兴), to produce and market a network card they had developed. The company name was based on the concept of "twisted pair link", a kind of electromagnetic cabling, hence the "TP" in the company name. TP-Link began its first international expansion in 2005. 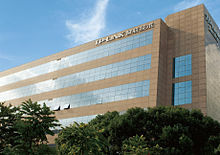 In 2007, the company moved into its new 100,000-square-meter headquarters and facilities at Shenzhen's Hi-Tech Industry Park. TP-LINK USA was established in 2008. TP-Link products include wireless routers, mobile phones, ADSL, range extenders, routers, switches, IP cameras, powerline adapters, print servers, media converters, wireless adapters, power banks, and SMART home technology devices. TP-Link also manufactured the OnHub router for Google. In 2016 the company launched the new brand Neffos for smart phones. TP-Link manufactures smart home devices under their Kasa product line. Computerworld reported in January 2015 that ZyNOS, a firmware used by some routers (ZTE, TP-Link, D-Link and others), is vulnerable to DNS hijacking by an unauthenticated remote attacker, specifically when remote management is enabled. ^ "Network-gear firm TP-Link thinks big in US market|Across Americas|chinadaily.com.cn". Usa.chinadaily.com.cn. 5 April 2013. Retrieved 7 March 2014. ^ Richard Xu (15 September 2013). "Richard Xu, Vice President - TP-Link". Businessinterviews.com. Retrieved 7 March 2014. ^ a b "TP-Link Transforms From Purveyor of Fine Tools to Smart Life Enabler". CNET. Retrieved 28 September 2016. ^ "Introducing The New TP-Link®-TP-Link Unveils Completely New Look and Brand Identity". TP-Link. Retrieved 28 September 2016. ^ "NEFFOS PHONES". Gadgets 360. ^ "Smart Home | TP-Link". 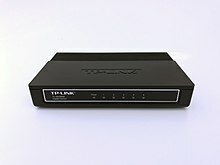 www.tp-link.com. Retrieved 16 September 2017. ^ "TP-LINK Targets Aggressive U.S. Expansion, VARs Included". CRN. Archived from the original on 5 January 2012. Retrieved 7 March 2014. ^ Constantin, Lucian (27 January 2015). "DNS hijacking flaw affects D-Link DSL router, possibly other devices". Computerworld. Retrieved 24 March 2018.